Click on one of the Mid-America shutter categories below for pricing & information! Louvers, Raised panels, Board & Batten - A Style For Any Window! Your source for affordable handcrafted vinyl exterior shutters! "The Most Popular Vinyl Shutters In The World"
Traditionally, shutters were simply used to cover open windows and doors, today, shutters are used to define and highlight windows offering a charming traditional character to modern homes. Mid America exterior decorative shutters are available in the widest range of standard sizes and colors, and can be custom built to order. Mid-America vinyl shutters are very easy to install and are virtually maintenance free. Modern exterior shutters are quick and simple to clean using soap and water and have a limited Lifetime Warranty. Decorative Exterior Vinyl shutters add curb appeal to your house. Mid-America vinyl shutters are available in many standard colors using our color through Polypropylene co-polymer along with a user paint-able version made from Polystyrene. 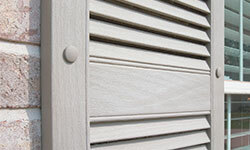 Standard size Mid-America Siding Components vinyl window shutters are a molded one-piece design. Custom Mid-America vinyl shutters are made from multi-piece components and are sonically welded together to form the completed exterior shutter. Vinyl shutters are by nature a decorative shutter and cannot be used for functional shutters with hinges, they are finished only on the front side and have a open "hollow" back. Like all exterior vinyl shutters they are used for decorative purposes only and are a great way to spruce up your home and add color and appeal. If you are wanting to hinge your Mid-America vinyl shutters for functional use we do have wood and composite shutters available for this purpose.